If I told you that adding one quick, easy step to your skin care routine can result in a more hydrated, smoother looking eye area, would you be interested? Yeah, I thought so. Get ready to amp up the power of your eye cream and see and feel a real difference, fast. I have added an update, at the end of this post for anyone curious to know how I feel about this product, a few months, on. A 58% reduction in the appearance of wrinkle depth in two months. 91% of trial participants saw disappearing crows feet, lines and wrinkles - even puffiness and dark circles. 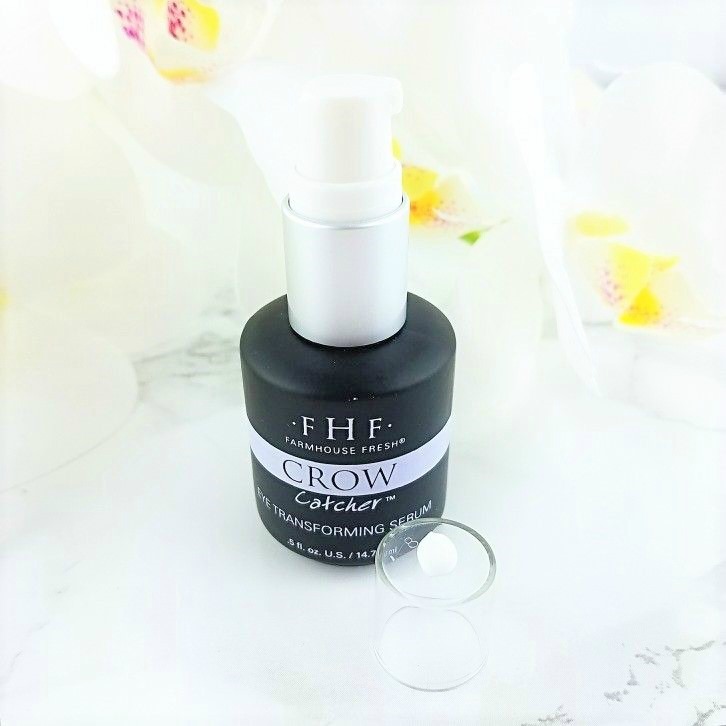 In just seven days, 100% of participants wanted to add Crow Catcher to their skin care routine. Seaweed extract: Omega 3 and Omega 6 oils help reinforce skin’s hydro-lipidic barrier. Bio-Peptide: Dermatologist-led clinical tests revealed 58% visible reduction of deep wrinkles versus placebo and 82% reduction in transepidermal water loss in 2-8 weeks. Ascophyllum Nodosum and Cyantophyta-class Algae extract: Rich in beneficial antioxidants, including vitamins C & B12. Caprylic Triglyceride is an excellent emollient that helps skin repair its surface and resist moisture loss. Organic Gotu Kola is an extract of Centella Asiatica and is known for its antibacterial, anti-psoriatic, and wound-healing properties. Okay, to be clear, I'm not claiming that I, at fifty-three suddenly have the exquisitely smooth, tight eye area I did when I was twenty. (Now, that would be a miracle!) What I am saying is, that by layering a baby pea sized pump of Farmhouse Fresh Crow Catcher Eye Transforming Serum, $47.00 - 1/2 fl. oz. under my usual eye cream, my eye area feels rose petal soft and looks even more refreshed, smoother and plumped up. When I speak and smile, my fine lines, the crinkling and little crows feet that appear and disappear are less visible, overall and that, gentle reader is a real result I feel good about. I am excited to see how this continues to work, over time. I really like this eye serum and I enthusiastically recommend that you give it a try. Update: I have been using Crow Catcher pretty consistently since this post first went live and I am pleased with the results. 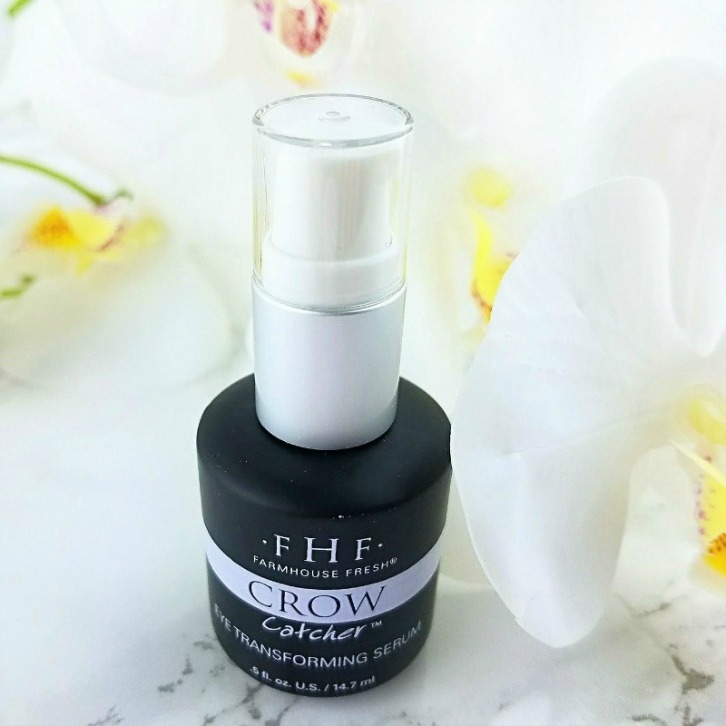 My eye area feels smoother, softer, looks and feels more hydrated and the appearance of fine lines and my baby crows feet are softened and diminished. This eye serum will definitely be a repurchase, when this bottle is all gone. What do you think? 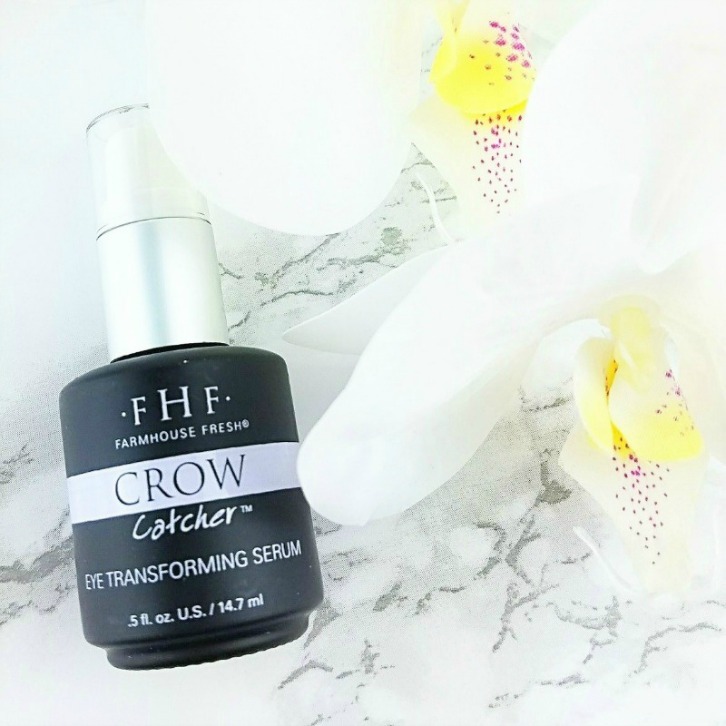 Is Crow Catcher something that you would like to add to your skin care routine? Have you tried it? I'd love to hear what you think. This sounds like a great product. I'm notoriously bad about using eye creams. You might like this one. It's hydrating but not greasy or weird. And it's never too early or too late to start pampering that delicate eye area. I use an eye serum & it definitely helps. I need to try this one from FHF! Dude, this one is so good. You'll love it. I had no idea that FHF launched this! I definitely ned to try it! Get it! It's so good. This sounds nice. I really like that its vegan and cruelty free! I'm a huge fan of FHF products. This sounds great! I find my eye area is not too bad right now but when I lose weight, I will be wrinkle city. I’ll have to look for before and after pictures of this when I’m ready for an eye cream that reduces wrinkles! You know I want this now. Really really want it. It's FHF and it's an eye serum, need I say more! Peptides are always a good idea! I've heard so many good things about FHF. I need to take advantage of their next sale. And I totally agree - the name is super fun! Really loving the packaging! I'm finding most eye products come in a jar that requires digging your finger into. FHF has the loveliest textures! I don't think I've ever been unhappy with any of their products, and I bet this serum is amazing as well. Seriously, such a great company! They need to be better known. My current skincare routine does a great job at keeping my eye area in good shape when it comes to wrinkles and smile crinkles, but if this can help with dark circles as they claim, SIGN ME UP! Wow - awesome testimony!!! Heck yeah, I want to try it!!!!! Okay, that might just be the cutest named products on the market!!! I totally need to check this stuff out, my eyes are getting to that point where they need even more TLC. An eye serum? Sounds a lot more sensible than an eye cream, TBH! I LOVE the name - very to-the-point! Love that it’s vegan and unscented! The name IS super cute! And it sounds like good stuff! I really want this, LOVE FHF! Yes I want to try this! I am still searching for the eye cream that changes my life.